Back in the fall I spent many nights at Tommy Thompson Park in Toronto with a sheet and blacklight, looking for moths. I caught many, all, of course, new for me, since I was just getting into moths and wasn’t familiar with anything yet. But I also caught a few less common species, and some notable things. 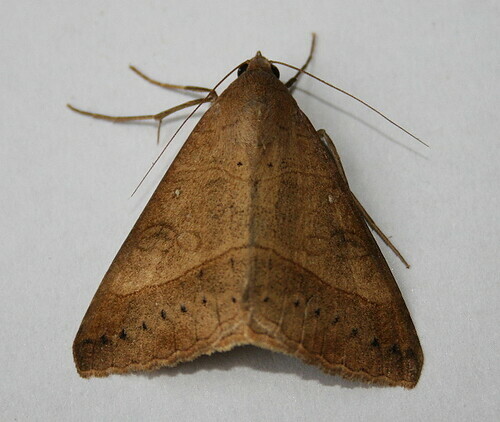 The above moth is a Small Mocis, Mocis latipes, a very rare vagrant up from the States into Ontario. I gather there’s just a handful of records for the species in the province. And I got two that season! So why do I mention this now, in August? A couple days ago I got a note from Susannah over at Wanderin’ Weeta (With Waterfowl And Weeds) that she’s finally got some results from an experiment she’d begun back in the winter. She had read my post back in the winter about the cattail caterpillar, the lavae of a moth that makes cattail heads go all fluffy during the winter. She had also noticed fluffy cattail heads where she lives in the Lower Fraser Valley of BC, and decided to investigate. All online resources indicated that the Shy Cosmet, the moth whose larvae I found in my cattail heads, did not occur as far west as BC, so when she found caterpillars in her cattail heads, she contained them so she could see what they turned into. The answer? Shy Cosmets. The species was not listed on the recently-revised 2008 version of the checklist of lepidoptera (moths and butterflies) of BC, and folks at E-Fauna BC are checking in with the experts to see if there are any other known records for the species there. It’s quite possible that Susannah has the first documented record for the province! Then today, Julie at Bootstrap Analysis made a post about some wasps she found in her yard. Back in the fall she started a personal project to document all the wasps, bees and flies that she found in her yard – not all that different from someone who keeps a list of the birds or the butterflies that visit their garden (and I’m sure Julie does that, too). Aside from discovering some wild-looking species using her yard, she also found a new state record that fall in the grass-carrying wasp Isodontia elegans. Also last fall she found the above wasp which, when she couldn’t identify it, she posted to BugGuide.net for help. It turned out it was a relatively new species to science – it hadn’t even been described yet (all species have a formal “description” that is published wherein they’re given a scientific name and the details of the species that differentiate it from others are laid out, as well as other known characteristics and behaviour). The species was identified on BugGuide.net by a professor at the University of Guelph (my alma mater!) as a new one he was collecting data on, and will be formally described by him in the near future. 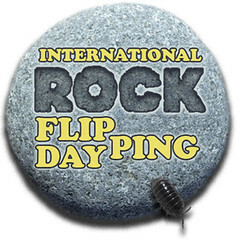 September 7 has been designated as International Rock-flipping Day. The event was inaugurated last year by Dave at Via Negativa, and went so well they’re doing it again. Dave and co-coordinator Bev of Burning Silo encourage everyone to go out on Sept 7 and flip a rock or two (or three or four if you’re having fun. Record and/or photograph what you find and send the results to Dave and Bev, whereupon they’ll gather everyone’s responses into a single spot and send it out to participants. You can post the results to your blog, put them up on your Flickr or other photo account, or, if you don’t have an online presence, simply send them off to Bev who’ll put them up on her site. Beyond just being a lot of fun, the project also has the potential to contribute to science by documenting species in places they haven’t been seen before, or behaviours that haven’t been observed, or other valuable information. More details at the official IRFD page. Yes, there is so much to learn about invertebrate right in our backyards. I’ve been studying beetles in Missouri for almost 3 decades now. Even restricting myself to 3 rather popular families of beetles, I continue to find new state records almost every year. I found my first new species in Missouri in only my 2nd year (a large, stunningly beautiful longhorned beetle called Purpuricenus paraxillaris), and in the years since I have discovered a handful of other new species. One just has to look! Regarding Rock Flipping Day, I hope everyone will remember to replace the rock. I chronicled the habitat damage that has resulted from failure to do so in my post about the Glades of Jefferson County south of St. Louis (and coincidentally the type locality of my first new species!). It just shows how little we know about how intricately the web of life is spun, and what it is we are losing with habitat destruction. Citizen science, it is a revolution, isn’t it. So many new things coming to light. You have to love it. That must be so exciting for Susannah and Julie. Congratulations to them both! Thanks for the story and link, Seabrooke!